Sue going up hill – which she did a lot! <- Read the previous update: We’re on our way! Hi all, and welcome to Day 3 of the ride. 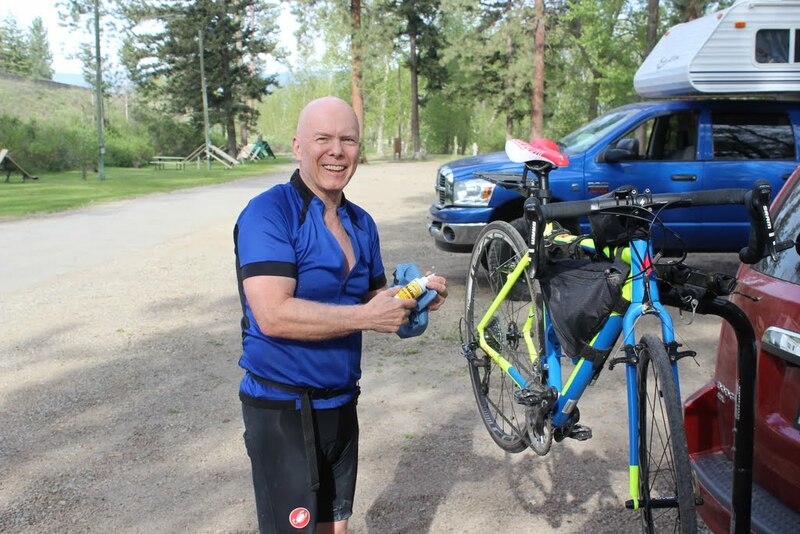 I have cycled many thousands of kilometers in my lifetime, over all sorts of terrain and with all types of weather. But I have to say, the trip from Hope to Princeton was one of the most grueling days I have ever had. Since we went all the way to Princeton to shorten our next day, we cycled 148 kms, and over not one, not two but THREE passes, for a total of over 70 kms of up-hill over the entire day. Some parts were as steep as 9% grades. 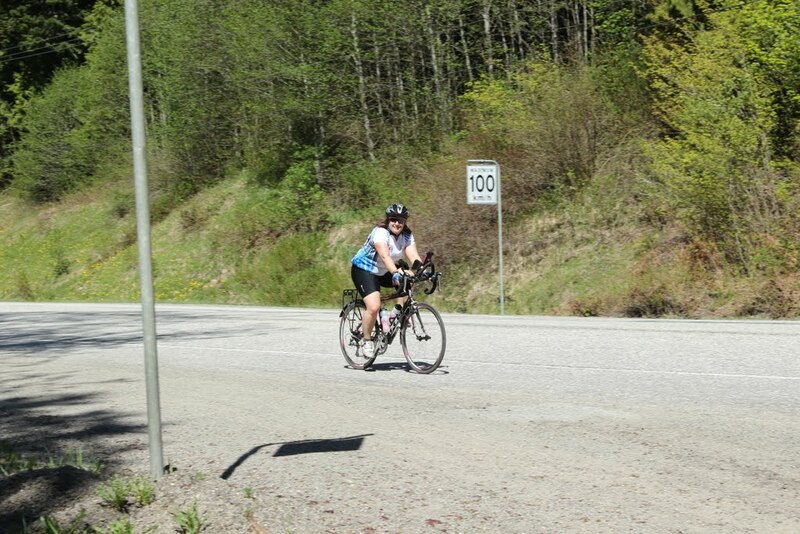 Amazingly, my legs held out fine, but I was thoroughly exhausted by the end of the day after 11 hours on the bike – yikes! And although I am a folkie at heart, I have to give thanks to Bruno Mars, Carly Rae Jepsen and Captain Tractor, all part of the “Upbeat” playlist on my iPhone, for getting me up those hills. We are all very proud of our accomplishment. We still managed to meet with more people and talk to them about the ride. A wonderful couple in a Smart car with 2 bikes on the top – I didn’t think you could do that with a Smart car!! – stopped to wish us well. 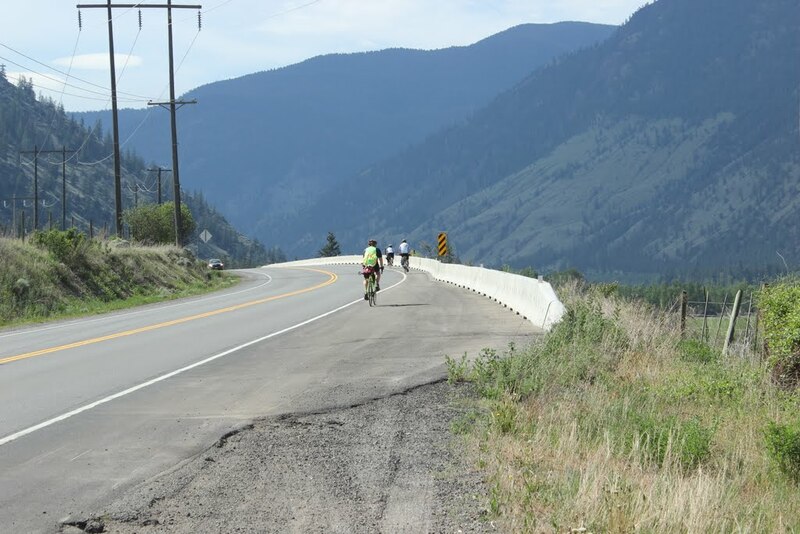 They were heading to Penticton to do some bike training for the weekend, so of course they were invited to our Kelowna fundraiser. All we had time for when we got to the campsite was to go out for dinner. Our bbq chicken had to be deferred to another night, as we didn’t want to cook in the dark, and we were all so famished. 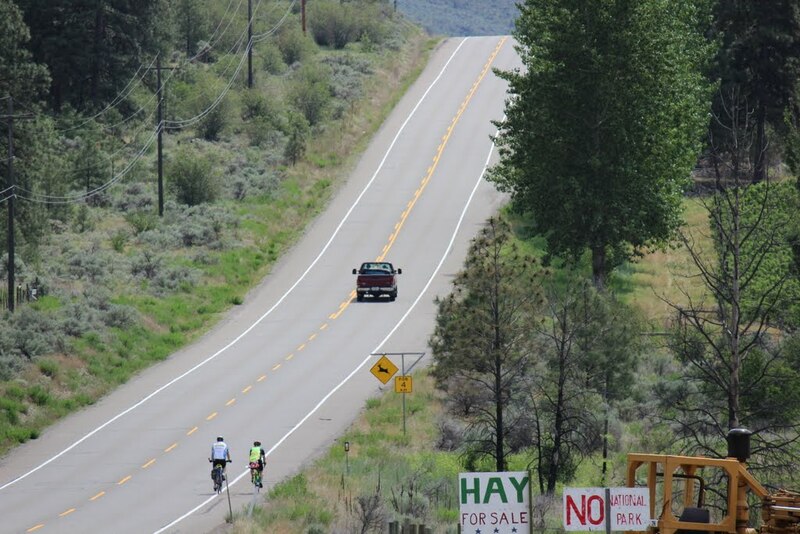 I wonder how many calories you burn in an 11 hour uphill ride?? Anyway, it was serendipitous that we went to Billy’s Family Restaurant (no relation to our fearless leader), because our server was the lovely and enthusiastic Reagen. She hugged all of us when we told her what we had accomplished so far, and in fact had heard about Hillary’s Ride from someone on Facebook. Isn’t social media amazing!! She took pictures of us, and coaxed the cook out of the kitchen to man the camera so she could be in the photo too, and posted it on her Facebook page. She talked about how she had been affected by depression, but with medication was doing very well. We appreciated her openness, which is exactly what we are trying to encourage. Thanks for the hospitality Reagen! I’d like to tell you more, but I was out like a light as soon as I had my shower – I barely remember my head hitting the pillow. 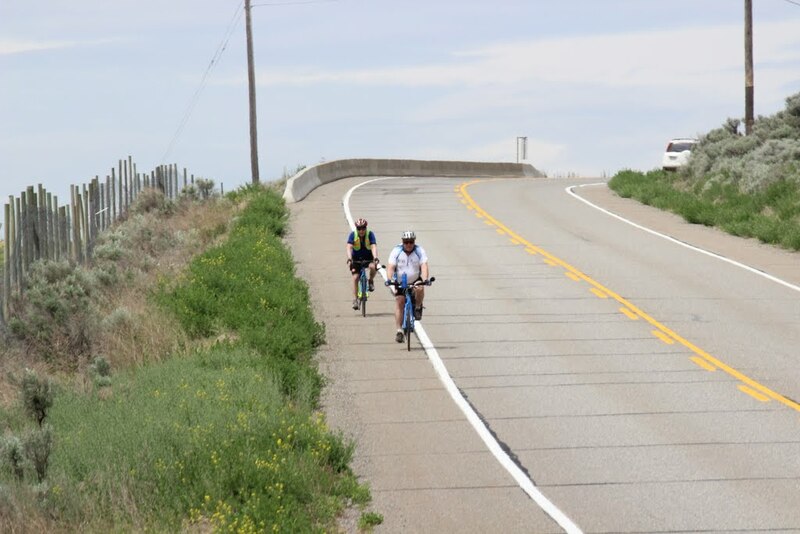 After a breakfast of pancakes by Chef Terry, we had a lovely ride out of Princeton for day 4 – it was mostly downhill all the way Keremeos – what a treat after yesterday! It was good to do an easy spin and work out the cobwebs from my legs. And did I mention how good simple food tastes when you cycle all day and eat in an RV? The best turkey sandwiches are made and consumed on the road!! Bill had a beautiful talk with a young man, Koy, from one of the Okanagan native bands just west of Keremeos. He said he would sing prayers for our safe passage across the country. It is so powerful to be enveloped in everyone’s blessings and wishes. But alas, the second half of the day was a bit more challenging, as I had depleted all the glycogen in my quads the day before. We had our first taste of a headwind for a short while, but in the big scheme of things, it was minor. Actually kind of nice since it was 27 degrees again.We had another decent climb near the 100 km mark, at the end of the day – sometimes those are killers! 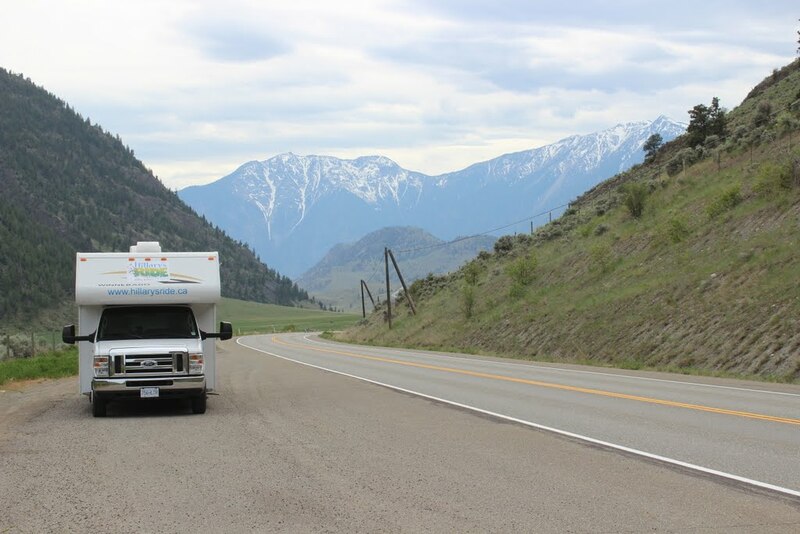 But we ended on a big downhill into Osoyoos, then we shuttled to our RV site in Oliver – except for Terry who cycled the extra way (he’s a biking machine!!). As I write this, we’re all in Patrick’s van, on our way to Kelowna for our 2nd concert in BC. Glad it’s Saturday, so we will miss any workday traffic, because we’re on a tight schedule. Only four days in, and I’m already losing track of the days. I’ll fill you all in on the concert with my next posting. Love and Hugs to everyone until then! 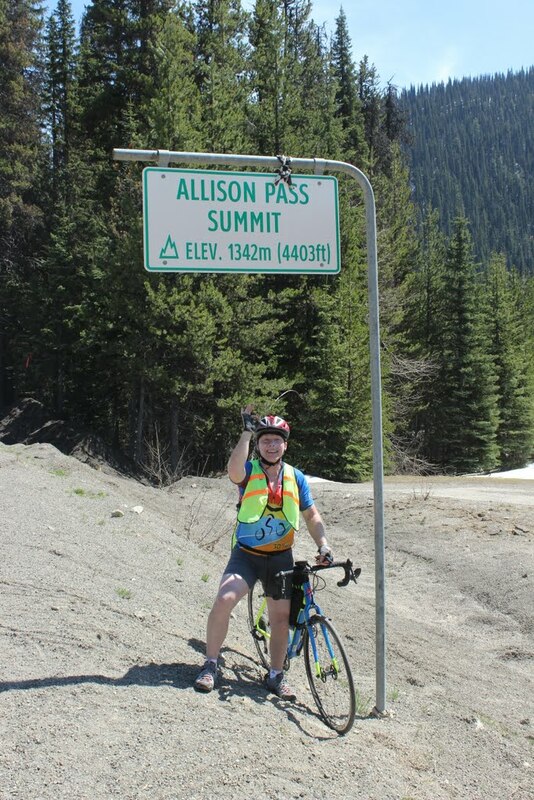 This entry was posted in Riders' Ramblings, Sue Sohnle and tagged bc, blessed, hills, more hills, passes, summits, tiring by Sue Sohnle. Bookmark the permalink. You guys are just flying! The importance of what you’re all doing is so great and we’ll be watching your progress with interest. We’re thinking of you Sue and wishing you good weather, good riding and know we’re all behind you. 148 km and 3 passes. Yikes! and BRAVO! Congratulations Sue to you and the guys on your first several days – you are all surviving what is likely to be the toughest part of the journey. And you are still on schedule! That’s great. Being so busy with events, preparations, planning, packing and all the talking/visiting with everyone before setting out – that meant limited training time and pre-conditioning opportunities. So it is to be expected that the first few days will be challenging – but the good news is that every additional day out your conditioning will improve and things will just get a bit easier. Your schedule certainly made for some very difficult days during your first week – very gutsy. But the first days are behind you now and you are on a roll. And a great big thanks for mustering the energy and fitting in the time to share your blogs and pictures – we will be following your journey closely, and anxiously awaiting your posts. We send our wishes that you all remain healthy safe and injury-free, and that the weather is your friend – both now and during the weeks ahead. Wow. Such hard riding and such up-beat writing. You inspire me. I think of you every day and hope you have a safe and fun ride. Hey Sue!! I am having a great time checking in with you through the day to see where the moving dot is and I am loving the posts of the events on the ride. You guys are awesome and you are doing such an amazing thing as so many people struggle with mental health, you all should be very proud! I can not wait to see you this Saturday somewhere on the road!! Keep smiling Darling!! Hugs to you all! Hope the ride is going well! My husband and I camped beside you in Princeton and I was just checking in on your progress. Mental Health issues face so many people we know and so the awareness you’re raising is wonderful! Love your blogs! They’re so well written, and it makes us feel like we’re right there with you, and really we are in spirit! Doing great – keep up the good work!! !